2010-10-19. New. Ships with Tracking Number! INTERNATIONAL WORLDWIDE Shipping available. Buy with confidence, excellent customer service! 2010-10-19. Good. Ships with Tracking Number! INTERNATIONAL WORLDWIDE Shipping available. May not contain Access Codes or Supplements. May be ex-library. Shipping & Handling by region. Buy with confidence, excellent customer service! DC Comics, 2006. 1st Edition . Soft cover. Near Fine. 4to - over 9¾ - 12" tall. A clean, tight and unmarked copy- " New York Times best-selling author Neil Gaiman's transcendent series SANDMAN is often hailed as the definitive Vertigo title and one of the finest achievements in graphic storytelling. 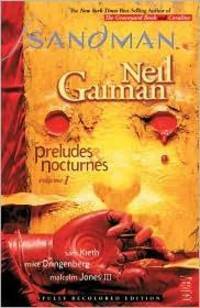 Gaiman created an unforgettable tale of the forces that exist beyond life and death by weaving ancient mythology, folklore and fairy tales with his own distinct narrative vision.In PRELUDES & NOCTURNES, an occultist attempting to capture Death to bargain for eternal life traps her younger brother Dream instead. After his 70 year imprisonment and eventual escape, Dream, also known as Morpheus, goes on a quest for his lost objects of power. On his arduous journey Morpheus encounters Lucifer, John Constantine, and an all-powerful madman. This book also includes the story "The Sound of Her Wings," which introduces us to the pragmatic and perky goth girl Death. Includes issues 1-8 of the original series. DC Comics, 2010. Paperback. Acceptable. Disclaimer:A readable copy. All pages are intact, and the cover is intact. Pages can include considerable notes-in pen or highlighter-but the notes cannot obscure the text. An ex-library book and may have standard library stamps and/or stickers. At ThriftBooks, our motto is: Read More, Spend Less.Dust jacket quality is not guaranteed. DC Comics, 2010. Paperback. As New. Disclaimer:An apparently unread copy in perfect condition. Dust cover is intact; pages are clean and are not marred by notes or folds of any kind. At ThriftBooks, our motto is: Read More, Spend Less.Dust jacket quality is not guaranteed. DC Comics, 2010-10-19. Softcover. New. GREAT Bargain Book Deal - some may have small remainder mark - Ships out by NEXT Business Day - 100% Satisfaction Guarantee!